Today, we're playing my CD Scottish Songs of Drinking & Rebellion from start to finish. If enjoy this album, please support the musicians who support this podcast, buy the CD, follow me on Spotify, and share the show. Pub Songs Podcast was produced by Marc Gunn. To subscribe, go to Apple Podcasts, Spotify or to our website where you can join the Gunn Runners Club for as little as $1 per month to support my music. You can get regular updates of new videos, podcasts, lyrics, stories behind the songs, plus 21 songs for free at www.pubsong.net. I want to thank everyone in the Gunn Runners Club on Patreon. There are 149 people who pledge a $1 or more per month so that I can keep creating new music and entertainment for you. You are amazing. I want to thank my newest Gunn Runners: Tammy G.
I was looking recently and I realized just how incredible membership in the club is. You get several albums of my music, videos, exclusive podcasts, and of course you're supporting this podcast as well as Celtfather Music & Travel. But you can also get discounts on merch, sheet music, and bootleg recordings. It's packed for just dollars per month. If you enjoy what I do, please consider making a pledge. St Andrew's is on November 30th this year. In addition to celebrating the feast of St. Andrew, it is also Scotland's official national holiday. So I'm gonna share my album Scottish Songs of Drinking & Rebellion, from start to finish in this show. This album was released on November 30, 2013, five years ago. It was fully produced, mixed and mastered by me. Nathan Deese is a Celtic musician from North Carolina. He sang background vocals on the album. He also played bass, guitar, mandolin, whistle and flute on "Come Ye By Athrol", Green Grow the Rashes", "Ye Jacobites By Name", and "Flower of Scotland". Daniel I Briggs sang background vocals as well and played bass, guitar, mandolin, octave mandolin and all other songs. Jody Richardson added violin on "Loch Tay Boat Song"
Jon Richardson played concertina on "MacPherson's Farewell". Most of the tracks were recorded in January 2011. I took my family on a trip up to middle-of-no-where Kentucky to record, while Gwen and baby Kenzie visited a friend in Lexington. I recorded this album, Don't Go Drinking With Hobbits, and St Patrick's Day all at the same time. However, there were two tracks I re-recorded parts later. One was "Mingulay Boat Song". The other was "Flower of Scotland". And when you listen to those, notice the background vocals because I used the wrong settings on my USB preamp. So they came off more compressed sounding. And I LOVED the sound. They kinda make the songs. I found it humorous that in "Ye Canna Shove Yer Granny" that I repeated a verse accidentally. And I didn't notice it while I was editing. The front Photo on the album was taken by Jan Czenkusch on our Celtic Invasion of Scotland in 2013. She also took the pictures inside the CD. I took the ones on the back. And graphic design was by James McDaniel II. 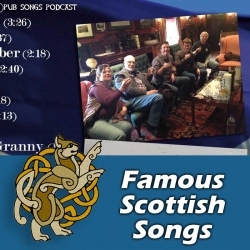 Now most of these songs are traditional except for "Flower of Scotland" which is by Roy Williamson. "Mingulay Boat Song" which is by Sir Hugh S. Roberton. "Mari's Wedding" is by John Roderick Bannerman. And "Skye Boat Song" is by Sir Harold Boulton.' And of course Robert Burns wrote "MacPherson's", "Jacobites", "Scots Wha Hae", "A Man's A Man" and "Green Grow the Rashes". I love this album. These are my absolute favorite Scottish, all except I couldn't get a good recording of "Loch Lomond". And some of these recordings, thanks to Nathan and Daniel, made this a powerhouse album in my opinion. Subscribe at Celtfather.com if you want to find out more about some of the songs in the future. And if you have any questions, email me.